In 1962, Marvel Comics was about to cancel Amazing Fantasy (AKA Amazing Adult Fantasy, AKA Amazing Adventures). Publisher Martin Goodman relented to Stan Lee’s desire to introduce a different kind of superhero since Amazing Fantasy was being canceled. This different type of hero would be a teenager and would have no sidekicks. He would have the common problems of teenagers. His family would not be well off like many superheroes but would have money problems. He would be the ordinary man who happens to receive powers. Amazing Fantasy #15 was written by Stan Lee (in the Marvel Style). Jack Kirby penciled Steve Ditko inked the cover art. Steve Ditko created the interior art for the story. This issue hit the stands August 1962. Spiderman was born in this issue. 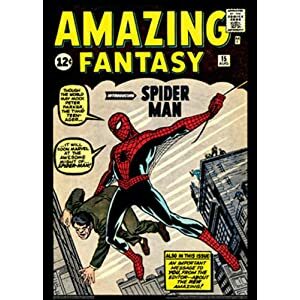 Amazing Fantasy #15 was one of the top selling comic books for Marvel of this time period. This quickly brought the Webhead into his own comicbook- The Amazing Spiderman. The Wall Crawler turns 50 years old in August. It is a busy year for the character of Spiderman and his alterego Peter Parker. The Web Slinger will also have a new movie this year. The Amazing Spiderman movie will reboot the Spidey series fresh and new. In this movie series we will finally see Doc Connors become the Lizard and Spiderman will have the web shooters I have been anxious to see. Spiderman will have a big year in comicbooks this year. The introduction of the Avenging Spiderman has been a hit (Premire was Nov 2011). Avenging Spiderman is a series where the Wall Crawler teams up with a member (or more) of the Avengers. The Amazing Spiderman continues to put out cool and interesting stories with “Schrodinger’s Catastrophe” (my favorite so far),“Planet Earth”, and the Sinister Six in “Ends of the Earth”. There is even an article in USA Today about it. Spidey has been my favorite superheroes since I was a little. I always felt I could relate to poor Peter in some ways. His life always appeared to be worse than mine. And the wisecracking Web Head is just a fun second persona that I love almost as much as Pete. Happy Early Birthday Peter and Spidey! You are still an early 20’s guy to me instead of 50. This entry was posted in comic books, Marvel Comics, superheroes, TV Show. Bookmark the permalink.